Adeptus Mechanicus, Imperial Knights, Astra Militarum and Thousand Sons: Vostroyan Ranges! 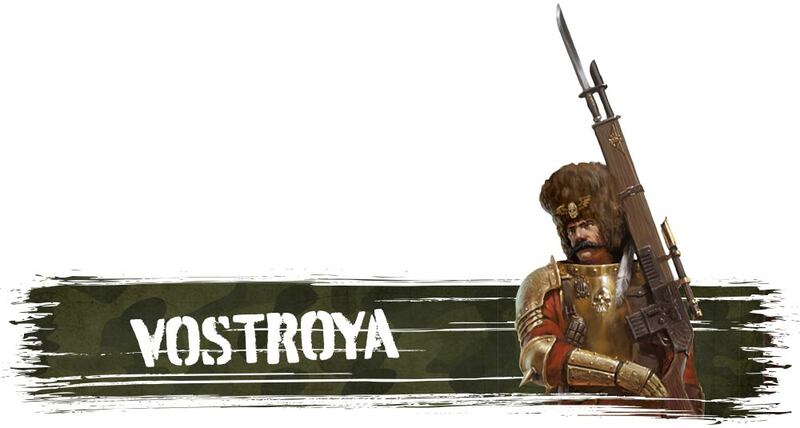 Today Warhammer Community has put up the preview for the Vostroyan First-born (incidentally the regiment I'm reading about in the novel Commissar), and my, oh my. This is insane. No kidding. Just look at what they have for their Doctrine. No, seriously. Just frakking look at it. I don't use heavy weapon squads so I ain't gonna talk about them. 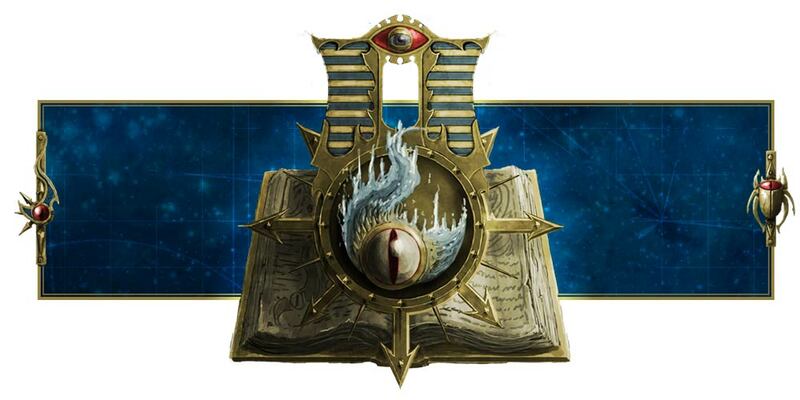 On the other hand, I should talk about the Vostroyan order, which isn't bad. Basically we get to shoot in the shooting phase even if we're locked in combat. Pretty nice for my Guardsmen with special weapons, like my heavy flamer and flamer command squad, or plasma gun command squad. I mean my flamer guys can double as plasma gunners since I glued plasma guns to their flamers. Heh. And they get 30" range now. 2 shots at 15". That's insane, isn't it? 30" range for plasma guns that can overcharge and re-roll ones with orders. That will be painful. HA HA HA HA HA! I like Sentinels, and it's cool that every weapon they have other than the heavy flamer benefits from this. Well, if you want to run heavy flamer Sentinels, you have the Catachans for that. Hellhounds and heavy flamer Sentinels benefit from the Catachans' re-roll D6 shots a lot. 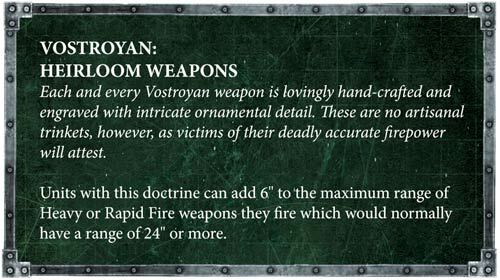 On the other hand, if you're packing heavy bolters, lascannons, plasma cannons and missile launchers, the added 6" range from the Vostroyans will be awesome for you (or us, since I'm considering using this Doctrine). Scout Sentinels can move 9" at the start of their game, even before the movement phase, so that's an additional 9" range for you, or for you to get closer by 9". And since you don't want to suffer penalties for moving when firing a heavy weapon, just take the 9" and add it to the extra 6" for an effective total of 51" range. Or something. Not sure how this works against enemies "hiding" on the table, because it seems more like a Stratagem for capturing Objectives rather than hunting them down, but Warhammer Community has a tendency to exaggerate. 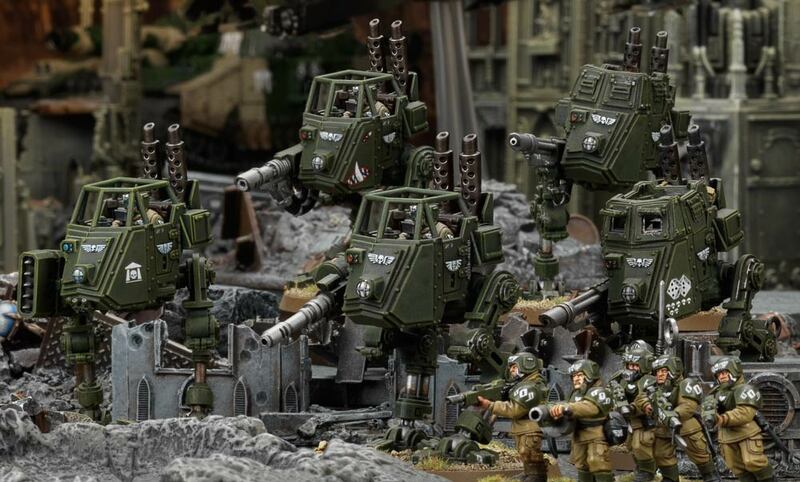 Anyway, this is a serious contender for my armored company, particularly since my Leman Russ Punishers (and maybe Executioners) need that extra 6" range, and my plasma Veterans or Command Squad can just go to town with 30" plasma guns! I can't wait for tomorrow's preview, which features my beloved Valhallan Ice Warriors! Thanks to Ciaphas Cain, I always have a soft spot for the Valhallans, and they were like my first ever favorite army before the Cadians. 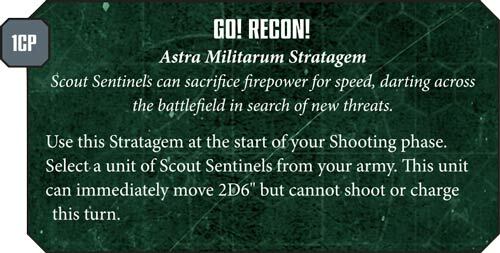 I hope they get a cool regimental doctrine as well!